Sorry for being gone for a while. The reason for my long absence was due to my involvement in a summer enrichment program called Summer Bridge. This program helped familiarize me with the college I’ll be attending, SDSU (San Diego State University). I enjoyed my experiences and accustomed to managing an academic life and a social life. I spent at least 10 hours or more juggling classwork from two classes as well attending activities such kayaking at a beach or explore racial discrimination in a social justice group session. The program lasted for 31 days and feel like a better person from being involved in it. No doubt I will be prepared for when I’ll enter my real college setting on August 29th. Since I feel bad for missing out on posting tutorials and other things. I’ll post some tutorials/tips this week on. I fixed the logo up a bit from last time and changed the flier design as well. 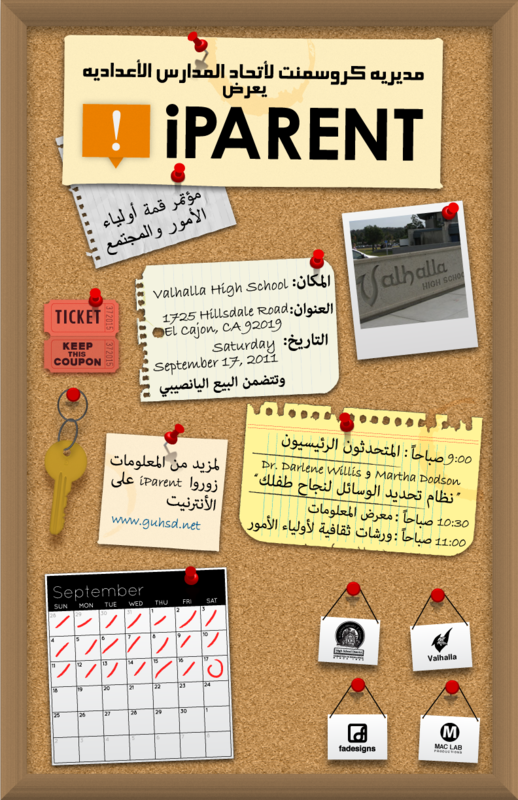 I’ve also worked on translations for this flier which include Arabic and Spanish translation. Click the flier thumbnail to see the Arabic translation. I’ll also be getting paid for my efforts. Since typing Arabic in Illustrator gave me such a huge hassle. I’ll post in a tip on how to bring in Arabic text into Illustrator. Posted on August 22, 2011, in Challenges, GUHSD, Jobs, Layouts, Posters, Projects, Realistic, Tips, Tutorials, Updates and tagged Flier, San Diego State University, Summer Bridge, Translations. Bookmark the permalink. Leave a comment.